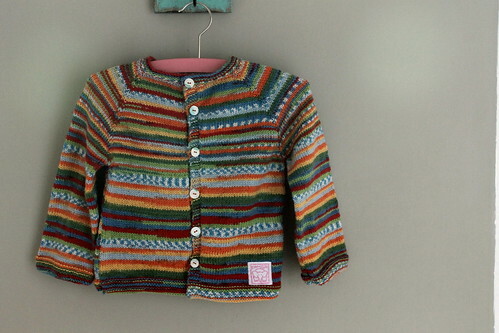 Christmas Eve, and I've finished this cardigan for Ernest this morning. I bought this gorgeous Adriafil self patterning yarn back in June, but only got around to starting to knit with it a few weeks ago. I decided to knit something really simple, and since Ernest refuses to wear jumpers these days I thought I might have more success with a cardigan. I began following a random pattern online, which I can't find now, but once I'd got past the shoulder shaping I just winged it. The sleeves could probably have done with some shaping, but I think I might get away with it. The buttons were 50p from Oxfam, and the label is an old one from stash. I'm pretty happy with the results, you know considering I'm a really average knitter. Ernest though says it's "rubbish" and refuses point blank to even try it on! Love this I am going to try and get some of this yarn! What a shame cause it looks great to us! Love that wool.